started from the year 2000-2001. More than 15-16 thousand youths and farmwomen from more than 180 villages of six tehsils brought in the network of KVK through this group dynamic concept. For information support to these groups, KVK started use of Information Communication System (ICT) which was first time in the country. More than 20 village IT centers were established in the year 2002 where farmers use to have direct interaction with the KVK scientist as well as other institutes related to health, education, sugar industry, dairy cooperative and credit cooperatives. Similarly during the year 2006, KVK also first time introduced the concept of providing mobile advisory services to these Farmers Clubs and SHGs. All the efforts have been appreciated at state/national level. There also we observed that majority of the rural community is out of reach from this information. 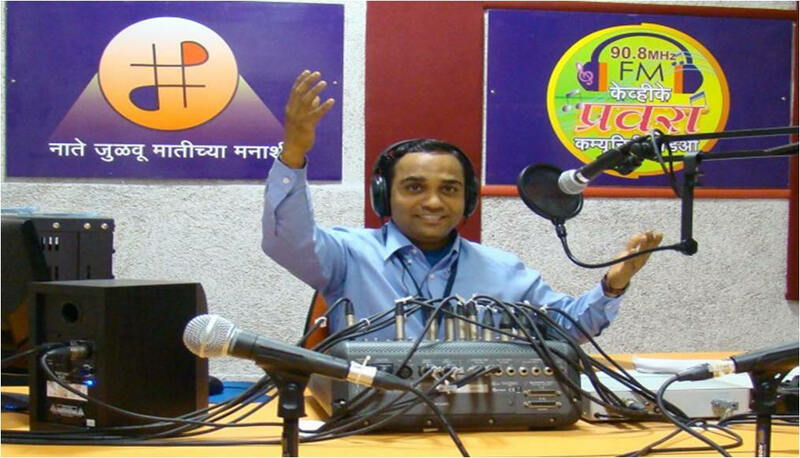 KVK started KVK PRAVARA COMMUNITY RADIO on 1st Ocober 2009 to provide the information in the format preferred by beneficiaries as per their convenience and demand. Small and marginal farmers, landless labors are the target group whereas more focus is given on rural youths and women which are being neglected by the present information dissemination system. . This radio is 100 per cent focusing on local issues, problems, solutions, success stories, failure or any location specific information. We consider, for getting good success outside, people should know their local condition. Think locally act globally is our main moto. That is why our logo is also Nate Julvuya Matichya Manashi (develop the relation with soul of our own soil) More interactive programmes, phone in programme, live discussion with successful farmers and KVK scientist, series of programmes on one issue. (Shetishala) weekly review of problems and solutions, daily information bulletin on happenings around community, educational opportunities from children up to entrepreneurship development, health and education problems etc. are main innovative efforts which have been appreciated by listeners.